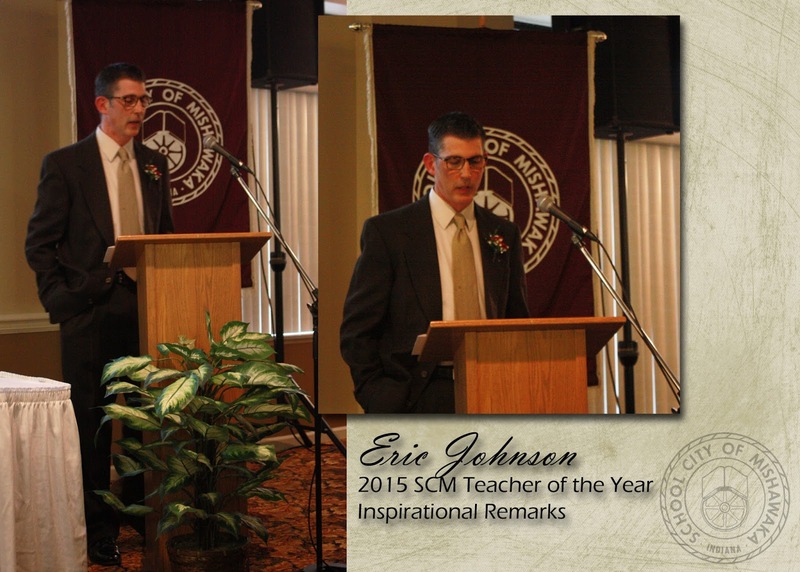 It’s been an honor to represent all of the great teachers in our district and those that are here with us tonight. It has been a remarkable experience to be the temporary placeholder for our collective excellence and to the efforts we put forth every day for our students. The title has been used in introductions at various conferences and virtual events over the last year and has given me a chance to share all that our students are achieving, and a chance to share what my fellow teachers are accomplishing in our classrooms. I’m thankful of that opportunity. Sharing “the good” is something I think we should do more of. Let’s discard the anachronistic viewpoint that sharing our student’s terrific work is somehow boastful or self-serving. Our student’s work and innovations, your tremendous work, and classroom innovations deserve an audience greater than the four walls of our classrooms and buildings. As Kevin Honeycutt says, "we’re not secret agents", our work doesn't require keeping things close to the vest. Teacher of the year has a singularity that I’ve never been completely comfortable with. The title, although appropriate for the purpose of recognizing an individual’s commitment to their students and their contribution’s to an organization, is moniker that elevates the recipient into a solitary position without proper acknowledgment of the whole. The recognition has always reminded me that I’m standing on the shoulders of giants. We’re never really alone. Sure, teaching can sometimes involve feelings of loneliness or isolation, but we are never alone in our endeavor to educate our children. The plaque that now hangs on my wall, for me, is a visual reminder for all of the unseen efforts that only get recognized by the students we serve. From the administration staff and leadership teams who support instruction and help make things function as smoothly as possible. To the miracle worker “lunch ladies” who manage to feed the hundreds of kids in from their kitchens with an efficiency that still amazes me. Ensuring that our kids get at least one good meal a day. We each benefit from the teachers in the preceding grades and the investments that countless educators have made in our students as they progressed through their academic career. When they first arrive at our classroom doors, our role, although temporary, is vital to that child’s development. Teacher of the Year could easily mean Teacher for the Year to any one of our district's students. Certainly, there are times when we are all THE teacher a child needs at a particular part of their lives. We may never know when or how we made a difference, but our students know, and on their behalf, thank you. To my kindergarten teacher, the cat herder, who somehow guided 22 different levels of experience and support, to all go in the same direction and who taught me that letters had sounds and helped me write my first sentence. You were remarkable. Thank you to my first grade teacher who sat by my side as I read my first book, and thanks for providing the spark of reading that followed me for the rest of my life. To my 2nd grade teacher who made me feel like a big kid when we tackled our math assignments and helped me to realize I could do this thing called school. Thanks to my third grade teacher who helped me navigate the shift from “learning to read” into “reading to learn” Your empathy and instincts intervened and helped me become safe again when you realized something wasn’t quite right. My fourth grade teacher, who I’ll never forget, because nobody ever forgets their fourth grade teacher. The one that recognized I needed a little more support and made sure I got it. Thank you to my 5th grade teacher who allowed me the freedom to choose how I could demonstrate what I learned and trusted me to do my best. The balance between freedom and obligation is something I never forgot. To my 6th grade teacher who made me stand up and perform my poetry in front of my grade liberated my timidity. Also taught me to be kind, always kind, for that’s how I will be remembered. It was my middle school teachers who understood that my development includes that selfish little stage and that even though I wasn’t the first or the only one to be going through these things in life, you always made me feel special. My freshman teacher recognized the terror in my eyes and helped me organize my work and schedule so that I didn’t fall through the cracks of my massive new world. Patience defined. To my 10th grade lit teacher who introduced me to the text that would make me realize that I could become much more to the world than what I had been giving. I wasn’t striving to become what I could be. And even though I’m sorry that I can’t remember your name, I’ll never forget how you inspired me. The art and music teachers who, while I couldn’t draw or play very well, made me appreciate those that can. My Junior year geometry teacher who pulled this “math’d out” math student along a seemingly meaningless topic and provided relevance and purpose to understanding this ancient content. Thank you to any teacher that taught this senior who was chasing grade points and class rank, but knew when my college application and FAFSA were due and adjusted the course load accordingly. Through AP exams and an acute bout of ‘senioritis” you exhibited patience that I hadn’t yet fully developed, but aspire to. The job we do is difficult, but nothing is more important than our kids. Thank you for inspiring our kids and for the tireless work you do for their benefit. They remember you. Your work has a permanence and impact that cannot be measured. As we get ready to recognize tonight’s recipients, please hold them up and be inspired by their excellence. Let them know they are not alone. Always appreciated, by those that hold them up. Teacher for the year is a great award a teacher can ever get. Congratulations on this award. Teaching is really tough because everyone can not share their knowledge to others. Only a good teacher can do that. I am a writer at best essay writing service and even I can't teach. A good article needs great effort. Your article has good information which is very helpful and interesting. Teaching is a skill and you did it in a great way.